The California Adventure Touring Plans are step-by-step plans for seeing as much as possible with a minimum of time wasted standing in line. They are designed to assist you in avoiding crowds and bottlenecks on days of moderate to heavy attendance. on days of lighter attendance (see the Crowd Calendar), the plans will still save you time but will not be as critical to successful touring. We developed many of these plans when preparing to visit the parks with our own children (ages 2 through 8). Most plans offer a mid-day break of at least three hours back at your hotel. It's debatable whether the kids will need the nap more than you, but you'll thank us later, we promise. The one-day plans are designed for adults and teens wishing to see as much of the park as possible in a single day. These Touring Plans are designed for The Whole Family, which may include small children, tweens, teens, and seniors. Are none of our premium plans perfect for you? With Personalized Touring Plans, you choose a date, arrival time, set of attractions, and any breaks you require. Then let our optimization software determine the best order in which to experience what you chose! Where should I eat at California Adventure? California Adventure offers a variety of dining choices. Take a look at all your options on our California Adventure Dining page. What are the best rides at California Adventure? Check our California Adventure Attractions page to see which California Adventure rides, shows, and other attractions rank highest overall and with age groups such as Preschoolers, Grade Schoolers, Teens, Young Adults, Adults Over 30, and Seniors. What are the least crowded times to visit California Adventure? Check out our Crowd Calendar page to find the least crowded dates for Disneyland as a whole and for Disney California Adventure specifically. In general, autumn after Labor Day and before Thanksgiving has the highest concentration of low-crowd days. Where should I stay when visiting Disneyland's California Adventure? There are more than two dozen hotels at Disneyland, plus hundreds of others in the immediate vicinity. Check out our Disneyland hotels page for ratings and rankings. What’s the best and cheapest way to buy tickets to Disneyland's California Adventure? Disney theme park ticket pricing can be complicated, with few discounts to be found. We offer advice to find the best Disneyland ticket pricing. Another good source of information on ticketing is MouseSavers.com, which offers information on all sorts of discounts related to Disney vacation planning. Our Lines app gives real time information about wait times in the parks, along with customizable touring plans. Download it on the Apple App Store or on Google Play. For other touring tips, start with our Disneyland Resort page. Heading to Disney World in Florida or Universal Orlando in Florida? 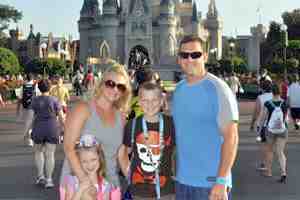 Check out our Disney World Touring Plans and Universal Orlando Touring Plans.